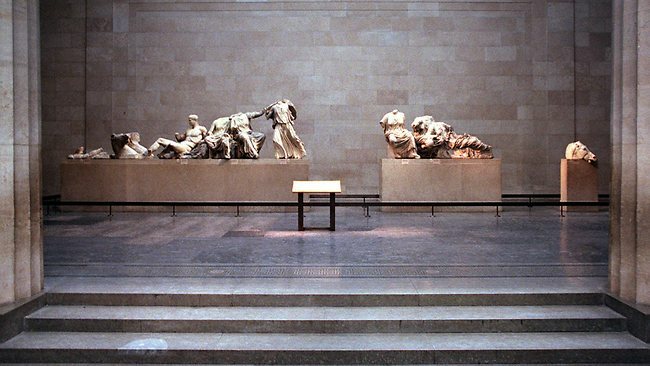 TURKEY has become only the second country after Greece to lay formal claim to an object in the British Museum, and is also demanding the return of a marble head in the Victoria & Albert Museum. The Turkish government wrote to the British Museum in January to demand the return of an unprepossessing carved stone slab from the 1st century BC, known as the Samsat Stela, which is on display in Room 52 of the museum. The 1.3m basalt stone is neither as well known nor as attractive as the Elgin Marbles, the most celebrated outstanding restitution case on the museum's books, but it is now part of a new front line in international museum politics. The stela was discovered in 1882 in a field near Samsat in the south of modern-day Turkey. The slab, which depicts the ancient King Antiochus I greeting Herakles, had previously been reused as an olive press and had a large hole drilled through the centre. It was bought by Charles Leonard Woolley, the museum's director of excavations, and became part of its collection in 1927. In the past two years Turkey has stepped up claims to objects in museums across the world, including the Louvre in Paris, the State Museums of Berlin, the Metropolitan Museum of Art in New York and the J. Paul Getty Museum in Los Angeles. While many of the claims are longstanding, they have been revived with a fresh vigour since the appointment of Osman Murat Suslu as director-general of cultural heritage and museums in 2010. Turkey has started refusing loan requests to museums with disputed objects, affecting exhibition planning. The V&A has had to postpone a show on Ottoman culture. The British Museum is trying to work out how to mount an exhibition about the Eastern Mediterranean in the time of Tutankhamun without what would have been pivotal loans from Turkey. Last week Neil MacGregor, the director of the British Museum, wrote to the Turkish authorities laying out the museum's case for retaining the stela. According to the museum: "At no point between 1927 and 2005 have the Turkish authorities, who were fully aware of the stela's location, suggested that it had been improperly acquired or should be returned." As with the Elgin Marbles, the museum has offered to lend the stela to Turkey for temporary exhibition if Turkey recognises the British Museum's ownership. Meanwhile, the V&A is waiting to hear Ankara's response to its offer of an indefinite loan of a marble head of a child that was excavated and brought to Britain in 1882. It dates to the 3rd century AD was removed from the Sidamara Sarcophagus that is now in Turkey. Privately, the V&A is more sympathetic to the Turkish claim than the British Museum because of the circumstances of how the head found its way into the collection, but it is forbidden by law to transfer ownership of the object. In each case, the disputes have a distinct political flavour. There is suspicion inside both institutions that individuals within the Turkish government are more interested in publicising the disputes for political purposes than finding a resolution. A senior source at the V&A said: "The ball is now very much in their court and we really don't know what's going to happen." IN his harrowing memoir, the Polish resistance fighter Jan Karski described how, on the run from the Gestapo, he was sheltered for months on a country estate owned by the Sawa family. Karski was eventually smuggled out of occupied Poland, reported the horrors of the Holocaust to Britain and the US and survived the war. The Sawas did not. In Story of a Secret State, Karski bleakly records that he later learnt that the "entire family had been arrested by the Nazis, tortured and executed". Their property was added to the vast hoard of loot stolen by the Nazis and never returned. Most property taken by the Nazis and their quislings was simply retained and nationalised under Poland's postwar communist regime. Some remains in private hands. More than two decades after Poland became a democracy, the issue of restitution is still a blot on its historical record. The total value of this expropriated property today is about $US60 billion ($56bn), including buildings, land and artworks. Many of the assets were seized from Polish Jews, some three million of whom, or 90 per cent of the prewar Jewish population, perished in the Holocaust. But of the claims for stolen property, only 17 per cent are made by Jewish survivors or their relatives - in most cases there was no one left alive to make a claim and no heirs to inherit it. An entire people was dispossessed. The Polish government has repeatedly promised to address the issue and to pay compensation for the plunder of private property and its postwar nationalisation. On joining the EU, Poland signed the European Convention on Human Rights, which holds that "no one shall be deprived of his possessions except in the public interest and subject to the conditions provided for by law and by the general principles of international law". Yet Poland remains the only country of the former Eastern bloc that has not introduced restitution laws. Hungary and Romania have laws enabling individuals to recover assets that were impossible to claim under communism. The Czech and Slovak republics have set up multi-million-euro programs to compensate Jewish victims and their heirs. Macedonia has enacted laws providing comprehensive recompense for wartime plunder. This year, the Polish government declared that it could no longer consider paying compensation because of the world economic crisis. Work on drafting a law has stopped. Paying even partial compensation, it was claimed, would add significantly to the national debt and exceed debt limits imposed by the Maastricht treaty. Poland claims it cannot afford to pay its historical dues. The greater question is whether Poland can afford not to. Poland was a victim in the war. Invaded by Germany and the Soviet Union, it was looted and ravaged, leaving at least five million dead. It has confronted the demons of the past with extraordinary courage and greater honesty than any post-communist country. The role played by the Polish underground and Polish exiles in winning World War II is finally being acknowledged. But by defaulting on a promise of restitution, Poland is undermining that achievement and reawakening grim ghosts. A magazine recently featured a cartoon that might have been published in 1939, in which an Orthodox Jew looks out over Warsaw and remarks: "Son, some day all this will be yours . . ." Jews did own 20 per cent of prime Warsaw real estate, which was stolen and never returned. Poland may be worried about debt, but it is hardly in the same economic league as Greece or Macedonia. A recent advertisement in the International Herald Tribune bragged that Poland was "one of the fastest-growing economies in Europe", with growth above 4 per cent expected this year. On July 1, for the first time, Poland took on the EU presidency. It now speaks for Europe, but what can be said about, for example, the trial of Ratko Mladic, when crimes from Poland's own past remain unrequited? Millions of Poles, both Jewish and Christian, were stripped of everything - homes, land, businesses, forests, factories and furniture. Under communism, those stolen goods often devolved to the Polish government or local authorities. Tracing their ownership is complex, but not impossible. At the very least Poland should open its archives to make it easier for its dwindling band of Holocaust survivors to draw up accounts in preparation for the day when Poland finally pays up. American criticism of Poland's foot-dragging provoked an angry response from Foreign Minister Radek Sikorski: "If the US really wanted to do something for Poland's Jews, a good moment would have been in the years 1943-44, when most of them were still alive, and when Poland pleaded for that through the testimony of Jan Karski." Poland rightly insists that humanity has a sacred obligation never to forget what happened on its soil, the savagery that Germany unleashed and the Allies' slow and uncertain response. The most powerful memorial to that duty is Auschwitz-Birkenau, where a foundation has been set up to preserve the crumbling buildings, gas chambers and crematoriums where more than one million Jews were murdered. By some unspoken calculation, balancing guilt, responsibility and resources, countries around the world have made differing contributions to the fund: $US80 million from Germany, $US15m from the US and $US8m from Austria. In May, Britain agreed to contribute pound stg. 2.15m ($3.23m). Even at a time of austerity that is cash well spent, for this is not about money but a moral accounting. As the Polish Prime Minister Donald Tusk said in 2008: "There is nothing worse than saying, 'I'll give it back', and then not doing so." Poland must give back what was taken under Nazism, kept under communism, what was promised and never repaid. The world owes a huge debt of memory to Poland, but so does Poland. During his recent visit to Italy, the President of Israel, Moshe Katzav, asked the Prime Minister of the Vatican, Cardinal Angelo Sudano, to prepare a list of all the Temple treasures, vessels, and Judaica that are being held by the Vatican. The President asked for the Vatican's co-operation on this sensitive matter. The Arch of Titus in Rome. The Jewish captives can be seen in Rome carrying the pure golden Menorah from the Second Temple in Jerusalem together with other holy vessels from the Temple. The major importance of this request is the fact that the Vatican holds the Temple Menorah of pure gold which, together with other holy vessels from the Temple, was stolen by the Romans and taken to Rome. After the destruction of the Temple and the Israeli kingdom in 70 CE, the Roman emperor Titus built a triumphal arch in Rome. The arch portrayed Israeli captives carrying to Rome the Menorah and other vessels taken from the Temple in Jerusalem. The information regarding the taking of the Menorah and the holy vessels to Rome and later, when the Roman Empire became Christian, being placed in the basement of the Vatican, has been passed down from generation to generation of the Jewish people. During the exile the holy Menorah and vessels remained at the focus of the memory of the Jewish people. Their dream was that one day soon they would recover them from the Vatican and return them to Jerusalem. This would be a sign of the beginning of the rebuilding of the Temple in Jerusalem and the redemption of the people and land of Israel. The fact that the Vatican holds these holy Temple vessels has been very well known since 70 CE. Many Jews traveled to the Vatican when they could do so to look for them and to see them. Some of the travelers testified that they had personally seen the golden Menorah and the vessels in the basements of the Vatican. Some priests have even confirmed this fact. On more than one occasion over the past years, The Temple Mount and Land of Israel Faithful Movement have demanded of the Vatican and the Pope that they immediately return the golden Menorah and the other Temple vessels as well as any other Judaica that they hold. The Vatican and the Pope have never responded to these demands. The Temple Mount Faithful Movement advised them to do it immediately and to no longer hold them in captivity and that, if they would not do so, the G-d of Israel would "help" them to do so. The Temple Mount Faithful Movement and all the Jewish People and Israel were very happy that President Katzav had requested this now and had given official status to the request. He did so in the name of all the Jewish People as well as the State of Israel. This was the first time it has been done by an Israeli president since the destruction of the Temple. It was a very important event. It signified in a very exciting way that Israel is now living in the prophetic endtimes of redemption, that the Temple of the G-d of Israel is soon to be rebuilt in Jerusalem, and that the golden Menorah from the Second Temple and the other vessels will soon be returned to Jerusalem to be used in the Third, endtime Temple. Many people in the world did not pay attention to this exciting, endtime event. This should move the heart of everyone in the world. It should be noted that a previous Israeli Minister of Religion, Shimon Shitreet, had requested the Vatican return the holy golden Menorah as well as the other vessels. He presented the Vatican with the results of historical research showing that the Menorah and vessels were taken to Rome (and later stored within the Vatican) together with the Israeli captives after the destruction of the Second Temple. The research was also based on the ornamentation on the Titus' triumphal arch in Rome which confirms it in a very clear manner. The request was ignored and even raised opposition and disapproval from the Vatican. Although the Prime Minister of the Vatican did not disapprove of the request by President Katsav, he did not show any readiness to accept it and no progress was made with regard to the matter. Sources in the Vatican denied that the Pope is holding the holy Menorah. They stated that the current Pope is sensitive to the life of the Jews and that he would act to return any item which has such a religious and symbolic value as has the Menorah. The sources said nothing about the request of the Israeli president to prepare a list of all the other holy vessels from the Temple. The reaction of these sources raised great disappointment and anger in Israel and among the Jewish people. Historians and researchers and everyone in Israel again stressed what has been very well known since 70 CE: the Temple Menorah and the other Temple vessels are, indeed, held by the Vatican in its hidden basements and, as in the past, they do not want to return them to the Jewish People, to Jerusalem, to be used in the Third Temple. Israel has very clear evidence, making this an undeniable fact. It is very well known that the Vatican also holds ancient Torah Scrolls, Jewish manuscripts, and other holy vessels in its basements. The Office of the President of Israel confirmed the president's request and stated that it is "a meaningful break-through and the first major request of this kind from an Israeli president". A beautiful mosaic floor from a synagogue in Chamat Tiberius (northern Israel) from the fifth entury CE showing the Menorah from the Temple in Jerusalem. The fact that the Vatican and the Pope are not ready to return the Temple Menorah and the other vessels to Israel will not deter The Temple Mount and Land of Israel Faithful Movement in their campaign to bring about their return to their rightful place in Jerusalem. Israel is now living in G-d's time of redemption and the Temple Mount Faithful Movement is the vessel of the G-d of Israel to rebuild His holy Temple on the Temple Mount in Jerusalem. The demand of the Faithful Movement is the demand of G-d Himself. We are His messengers to present it without delay. It will not help the Vatican and the Pope to try and stop the march of the prophetic history of Israel and even all the world. They have no chance to fight against the G-d of Israel and His clear intention to redeem Israel and all the world and to rebuild His house in Jerusalem. Israel is now in the midst of a major, prophetic, endtime struggle and campaign to rebuild the kingdom of G-d in the land of Israel, to once again locate the G-d of Abraham, Isaac, and Jacob in His rebuilt house in Jerusalem on Mt. Moriah. It is the desire of G-d Himself to see the original Menorah and the holy vessels from the Temple liberated from captivity in the Vatican and used in worship in the endtime Temple. We advise the Pope and the Vatican to give up trying to stop the march of G-d and history to Jerusalem. We demand of them that they immediately return the Menorah, the holy vessels, and other holy items to Israel and Jerusalem before the anger and judgement of G-d forces them to do so. However, as we see, we are living in very special, exciting, and prophetic endtimes. We are witnesses of the fulfillment of endtime prophecies by the prophets of Israel thousands of years ago. The time of the destruction, exile, and captivity of Israel is over, thanks to G-d, and we are living in the midst of a very exciting time of redemption that for so many years was a dream, a desire, and a prayer of the people of Israel. It is now becoming a reality. We are witnesses of major endtime events. Many more will occur in the near future. The significance of this for all mankind is even greater than people can imagine. We are at the beginning of a major godly time and everything will come from Jerusalem, from the Temple Mount, the holy hill of G-d. Oour lives are completely dedicated to this end. Everyone is called on to lift their eyes to Israel and Jerusalem — mainly to the Temple Mount — to see what the G-d of Israel is doing now in the holy land with His people, Israel, and what He will do in the near future. Blessed are and will be the wonderful friends of Israel and the Faithful Movement who have decided to be a part of this major event and who stand so devotedly with us. They have heard the call of G-d and answered it with no doubts. Together we shall soon see the great godly fulfillment.